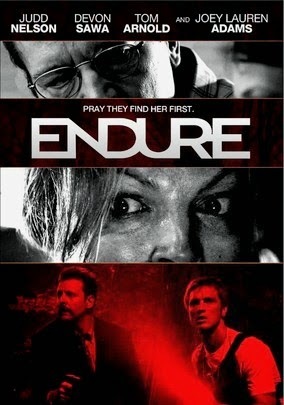 There is nothing more fun to watch than a good mystery and the truth is that I loved every minute of the film, Endure, but it did have a critical flaw. Similar to what you see on TV, the film tells us who the bad guy is almost right away, making the film about the investigation rather than the mystery. A fatal car accident on a desolate highway has led to a shocking discovery. Inside the car, police find evidence that a woman has been abducted. Now the clock is on to find her and to see if in fact the man was working alone or had help. The cast pairing in this film appealed to me before I'd even seen the film, as in 2010, you have an investigative team made of an 80s teen idol and a 90s teen heartthrob. Right away, I knew there would be an interesting dynamic, but it was far an above what I expected. 80s party animal, Judd Nelson, stars and this time he's the seriously uptight, by the book guy that he despised and challenged for a decade. Nelson is paired with Devon Sawa, a favorite actor of mine, who long ago proved that he had a lot more going for him then just his looks. Together the pair are complete opposites, and go about things in completely different ways in order to achieve the same goal. As horrible as it sounds, this film was just a lot fun to watch. The material may have been dark and serious, but watching each man do his own thing and then try to work together was fantastic. I am just really bothered by the fact that we know the whole story twenty minutes into the film. That's fine for an episode of Law & Order, but in a film with such a unique dynamic, I would have loved to have seen a surprise ending. All that aside, Endure has a great cast and really does stand out from the dozens of other films produced every year about simple police investigation.